The View is a fifth generation farm set in fruit orchard country south of the town of Kelowna, British Columbia, Canada. 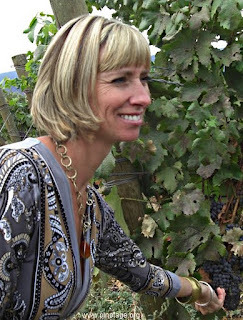 The winery name comes from the amazing view of Lake Okanagan from the highest part on the farm where the tasting room was planned to be built. But that is on hold and tastings take place at the winery and office in an old apple packing facility next to the roadside. Here I met the ebullient owner, Jennifer Molgat (pictured left inspecting Pinotage), winemaker Bernhard Schirrmeister and vineyard manager Willem Semmelink. 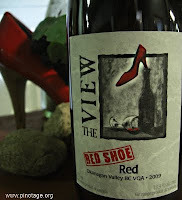 It is Jennifers red stiletto shoes that have become the winery's logo and each wine comes with a shoe pairing recommendation. Eight years ago they planted 4 acres of Pinotage and because the variety was successful they have planted another 4 acres. The soil is sandy loam with some clay on the lower slopes. Jennifer drove me up the hill behind the winery to see the views of Kelowna and the lake. We passed vines laden down with large black bunches of Baco Noir which will be sold to other wineries, and pale green Riesling. 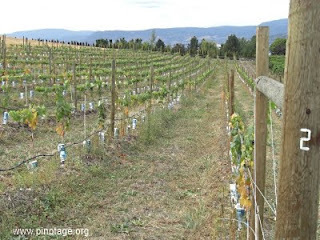 Pinotage is grown on high trellises and some of the older vines are on their own roots but phylloxera has been detected nearby and the new Pinotage vineyards (pictured above) are grafted.